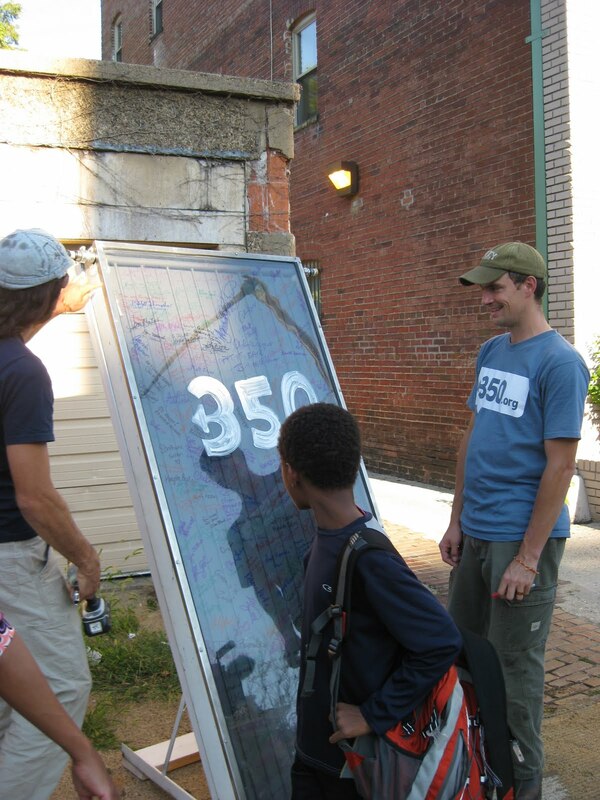 Unity College in Maine students display the Jimmy Carter solar panel on the sidewalk prior to the official event inside the All Souls Unitarian Universalist Church in Northwest D.C. Given the gravity of global warming, a house of worship was the perfect place to welcome a group of students who traveled all the way from Maine to try to convince President Obama to re-install solar panels on the roof of the White House (Jimmy Carter first installed them in 1979 and Ronald Reagan removed them in 1986). The historic All Souls Unitarian Universalist Church on 16th Street in Northwest Washington, D.C. was the setting Thursday evening for a soulful panel of speakers and an enthusiastic audience who welcomed the students from Maine's Unity College at the end of their road trip. They brought an original Carter-era solar panel with them which they planned to deliver to the White House. The students, who were accompanied on the trip by environmental activist, author and 350.org founder Bill McKibben, drove their vegetable oil-powered van to Boston, New York City and finally to D.C. for the meeting at the White House on Friday morning at 9 a.m. The organization 350.org is named for the upper limit of CO2 parts-per-million in the atmosphere before the climate change tipping point. In addition to the Solar Panel Road Trip, the organization is busy preparing for a global climate change day of action on 10/10/10. "We think (the failure of the climate bill) is a gift to the administration because it allows them to show everybody how committed they are to clean energy," said McKibben about why he is cautiously optimistic the White House will be receptive to the idea of re-installing solar panels on the roof. 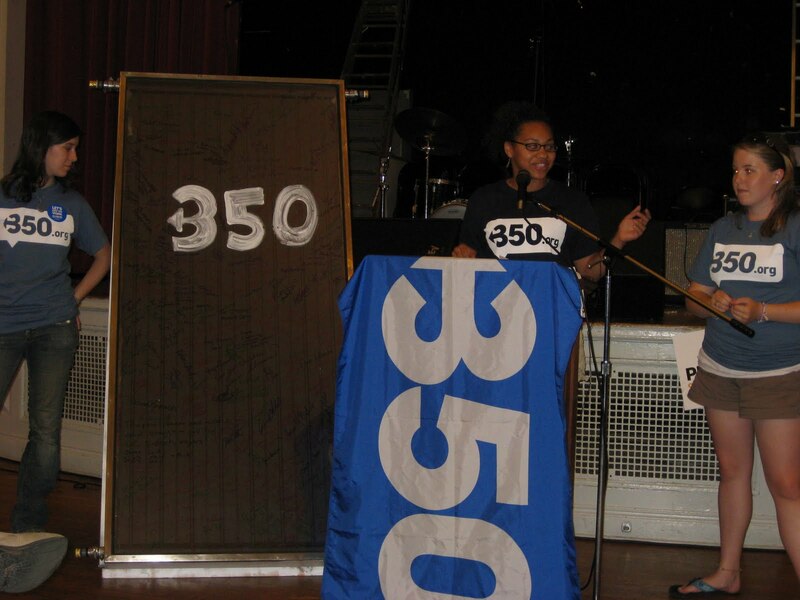 Unity College students speak about the solar panel road trip and environmental education. In addition to the students and McKibben, other speakers included Hip Hop Caucus CEO Reverend Lenny Yearwood Jr., All Souls Executive Director Katie Loughary, Chesapeake Climate Action Network founder and director Mike Tidwell, and one of the laborers who helped install the first solar panels on the White House roof. "I know people who don't believe in global warming and even they like solar panels," said McKibben. "What's not to like?" McKibben cited Michelle Obama's White House vegetable garden as an example of how the First Family can influence millions of Americans by such a simple gesture. "When Michelle Obama planted that beautiful garden, the next year the sale of vegetable seeds went up 30%," said McKibben. "People already knew intellectually that there was such a thing as a vegetable garden -- you plant the seed in the ground and it grows into a vegetable -- but clearly it was useful to see it acted out in public on the most important piece of real estate that we all together own as Americans." McKibben candidly could give no guarantees that we still have time to slow down or reverse climate change or that there is even the political will to begin to tackle this massive problem. But he did have one rock solid guarantee that left the audience with some hope. "There are lots of people around the world who will keep doing this work until the absolutely bitter end. They will continue to work as hard as they can to solve this problem." The energy and heat from the sun is free. Once solar panels or solar thermal collectors are set up, there are no electrical expenses necessary to power them. Isn't that make sense? We also need to take into consideration the safety of the students who are volunteering for the sake of the environment. It's a herculean task to use and promote green technology. I commend this students. The solar power is free indeed, but how about the solar panel itself? How much does it usually cost? Many people don't want to invest in such equipment knowing that the cost does not end in there. You still need to properly install, disconnect, reconnect, and test the electric wiring. That method will also cost money. On the other hand, this type of energy is a good alternative for everyone to save electricity consumption. Who wouldn't want a free energy? Harnessing the power of the sun and converting it into pure energy and using it instead of normal electricity is very ingenious. That is really true. Sun is a source of free energy that everyone can use. The invention of solar panels maximizes the natural energy sources like the sun. I hope that solar panels will be made affordable for everybody. I have a small solar panel which we installed 2 months ago. I contacted an electrical repair Garden City office to help me fix my wiring. They really did well in making my wiring system safe.